Tough challenges face Pacific journalists. A new book, Mekim Nius, explores the issues as more Pacific media people migrate to New Zealand. JOURNALISM is a tough job in the Pacific. Dealing with coups, mercenaries, civil war, ethnic conflict and constitutional crises are just part of everyday life for many journalists. It takes guts to face the challenges. And learning about the job is equally challenging, especially compared with New Zealand. 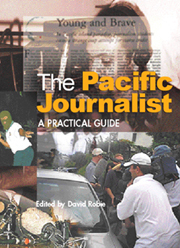 While neophyte NZ reporters learn about local body reporting, basic news reporting techniques, shorthand and legally safe newswriting, Pacific journos often have to equip themselves with such skills as reporting coups, sedition or mutiny, dealing with "payback", multilingualism and cross-cultural news gathering. Student journalists who honed their skills at the University of the South Pacific by covering the George Speight putsch in May 2000 dramatically improved their skills. So fast did they develop with their baptism of fire that a British media industry newspaper headlined an article about their exploits: FROM TRAINEES TO PROFESSIONALS. AND ALL IT TOOK WAS A COUP. Among departures from Fiji in the wake of Sitiveni Rabukas military coups in 1987 were one of Fijis most gifted editors at the time, Nemani Delaibatiki of the Fiji Sun, who joined the Waikato Times; and former Fiji Times reporter Richard Naidu, Fijis first journalist of the year. Naidu later returned to Fiji to become a leading lawyer and he frequently provides media with legal advice. Prominent broadcaster Mere Lomaloma, who is now Pasifika Festival organiser in Auckland. Jale Moala, Fijis best and most versatile editor, who left the Daily Post for the Southland Times and eventually joined The Press in Christchurch. Sudesh Kissun, of The Fiji Times, who was recently hired by Rural News. Top political reporter Riyaz Sayed-Khaiyum, who is now with Asia Down Under but biting at the chafe. Both Gounder and Lomaloma hold masters study scholarships in communication studies at Auckland University of Technology, which introduced both undergraduate and postgraduate scholarships in partnership with the Pacific Islands Media Association (PIMA) to boost Pasifika media options. Many migrating journalists share a similar experience. Although many have landed on their feet, they often face resistance in New Zealand over recognition of their qualifications or experience. It is often difficult to land a good job, even when the journos experience has often been more challenging and demanding than an equivalent Kiwi in the media. Besides political pressures forcing journalists to leave Fiji and other Pacific countries, the media people are also hit by other factors that are driving them to leave the region. With deteriorating health, education and law and order standards, people are looking for greener pastures to ensure the future of the children. It isnt just Indo-Fijian journalists leaving Fiji, many indigenous Fijians are also joining the exodus. While racial issues do play a part, a combination of factors is actually at play. "Pacific Islanders ought to study for at least a year (graduate diploma) in journalism to get a feel of how the system works in NZ," says Kissun, who edited a community paper before taking up his current job with Rural News. "Also we ought to take advantage of opportunities provided by the university during work experience attachments. Were like a bar of soap and the editors dont really know our capabilities. "It is during such work attachments that we can shine. For me, getting a job resulted from my performance during my two-week work attachment. So my advice is to come through the NZ system and use the course as a stepping stone into the mainstream media in NZ." New Zealand has a rapidly growing Pacific vernacular media  broadcast, newspapers, magazines and online. What are some of the differences with the diverse media in the region? "The vernacular media act as the one stop shop' for each community," says Kissun. "Theyre quickly able to get their community news from within NZ and political and other news from back home. The media here operate much more freely and are able to report sensitive issues that cannot be reported by media back home." Traditional obligations are also so prominent in New Zealand so vernacular media are not restricted in their coverage. 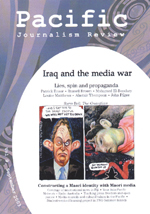 "Vernacular media in NZ is more closely aligned to the mainstream media in terms of freedom to report on issues. This is because Pacific communities themselves enjoy greater freedom of expression and political freedom. So they expect the vernacular media to be the same." A major concern in the Pacific is very low pay for journalists, a situation that the industry is reluctant to debate or research. This raises the question of how independent the media really is with such low pay, or how exposed the media may become to the influence of so-called envelope journalism  inducements by unscrupulous politicians, as in Indonesia, the Philippines, Papua New Guinea or the Solomon Islands. According to former leading Fiji newspaper editor Jale Moala, "pay is the greatest obstacle to developing journalism in the region". Along with journalists and the media industry, growing corruption is also causing unease among the educators. "Lack of funding is a real problem. And ethics," argues University of Papua New Guineas media academic Sorariba Nash. "I am starting to sense this massive corruption coming" into society. He believes there has been a dramatic rise in junkets and freebies being used as inducements from mining companies and other corporate big spenders to win over journalists. Former Pacific Islands Media Association president Kalafi Moala has called for sweeping media reforms in the region: "Island journalists sometimes play servants to corrupt policies formed without public participation  and in some cases these policies have been unconstitutionally and unlawfully formulated and executed. "Media business and commercial interests have usurped the traditional role of adequately informing people. They may be entertained, horrified, titillated and stressed, but not informed." Auckland-based Moala is cautious about training journalists and media practitioners without media industry reform  "it would be like sending in soldiers to a war zone without a mission". In recent years quarrels between island governments  such as Cook Islands, Fiji, Kiribati, Niue, Solomon Islands, Tonga and Vanuatu  and their own media have been increasing. "In just about every case, by using propaganda through their own media, island governments have harassed dissenting media with accusations of 'unprofessional', 'unbalanced reporting', and even 'cultural sensitivity'. In Tongas case, noted Moala as keynote speaker at the opening of the Journalism Education Association conference in Suva in December, "it was serious enough that the government acted foolishly to change the constitution and media and newspaper laws to indiscriminately ban the media." For me, teaching media in the Pacific for almost a decade and educating a generation of journalists in Fiji, Papua New Guinea, Samoa and Solomon Islands has been very rewarding. It has provided me with the opportunity of meeting many committed, courageous and talented young journalists who will support democratic values in their society. Just to name a handful: Robyn Sela, daughter of PNGs first indigenous editor Luke Sela, became an investigative and defence reporter for the Post-Courier; Gorethy Kenneth, a feisty young Bougainvillean who became the Post-Couriers chief reporter; and Reggie Dutt, a Fiji Television reporter who became a human rights documentary maker. They have all made their mark in the Pacific. Tragically, in late 2003 Robyn Sela died young from cancer some months after being threatened at gunpoint by a soldier.